You are here: HomenextPeoplenextBusinessesnextPeacock's, about 1946-47. 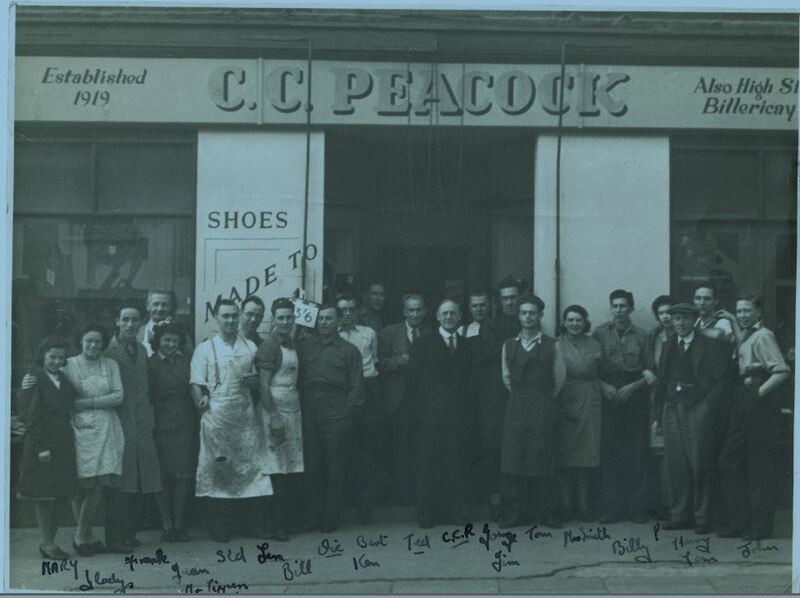 I have attached a picture belonging to Mum, taken outside Peacock’s shoe makers and repairers, around 1946-1947. Mum, Jennifer Woodcock, nee. Taylor, worked there along with her two brothers. Peacock’s was roughly where Ede’s electrical shop is now, next door to the fish and chip shop that used to be Thompson’s, where they sold wet fish and fish and chips. (Thompson’s also had another shop on the High Street, where Bargain Land stands now, opposite Aldi.) Peacock’s was a large business so possibly took up two to three shop fronts.